In this unit we will be using exploring how pathos works. We will examine how language can be used to create an emotional response in an audience by investigating poetry, speeches, print advertisements and movies. We want to see how language can emotionally impact people and so create change on important globalisation and sustainability issues of our time. Session 1 – What ‘moves’ me? 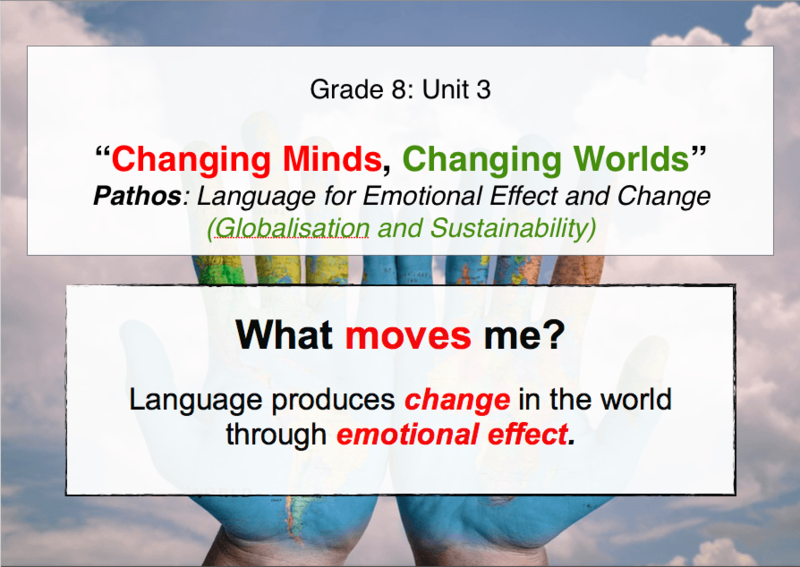 We kick off our new unit with some fun games and activities to get us thinking about how language can affect our emotions and so produce change in the world! We will also revise our background knowledge of some poetic devices. We will start by learning about the three branches of rhetoric: pathos, ethos and logos. Then, we will examine a public speech about environmental sustainability. In these lessons, we will explore the topic of ocean pollution. After completing some brief research to gain some contextual knowledge, we will examine a variety of texts that are designed to create an emotional impact on an audience (including sonnet poetry and print/video advertising). In these lessons, we will explore the topic of deforestation. After completing some brief research to gain some contextual knowledge, we will examine a variety of texts, including poetry, print and video ads, that aim to emotionally persuade people on the issue of cutting down trees. In these lessons we will explore the topic of global poverty. Will will be watching some videos, doing some secondary research, and examining poems that deal with the topic of poverty to develop the understanding of why poverty is such a significant problem. We have learned about many different globalisation and sustainability issues throughout this unit and examined multiple texts that raise awareness and persuade audiences to take action on an issue. Now it is your turn to research an issue of concern and create your own persuasive text to create positive change in the world!